the rail network and the higher speeds of modern trains lead to higher stressing of the rails. The state of the tracks must be inspected regularly to prevent costly incidents. The wear of the rail head is an important parameter in reliably assessing the state of the rails. If the wear is too high, this can lead in the worst case to train derailments. Conventional inspection methods are based on visual manual inspections. This procedure is however fraught with disadvantages: too slow, too inaccurate and therefore inefficient. 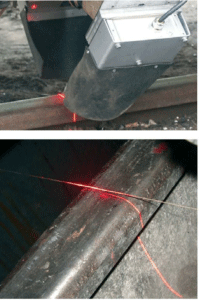 The most innovative technical solution for railroad rail measurement is the profile sensor scanCONTROL 2800. 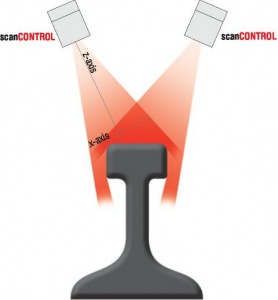 Scanning laser sensors or so-called light-section sensors have been available on the market for some time. Extensive tests have shown that they are too slow and have problems with the different reflective properties of railroad rails which can be shiny metallic and also corroded in some places. The scanCONTROL2800 is the fastest precision profile sensor on the market and is therefore the only one to fulfill the requirements with regard to speed and accuracy. The measurement occurs without contact and it is very accurate and fast. To be able to acquire the whole profile of the rail head two LLT sensors are required. Per inspection car four systems are employed which are synchronized to each other. The measurements take place at speeds of up to 100 km/h. In the measurement computer an ideal profile is saved which is continually compared to the measured profile. If the preset tolerances are exceeded, the rail is classed as unsafe and marked in the PC. Sensor with modified focusing distance. 1. Per rail 2 x LLT2800-100(205), i.e. 4 sensor systems per inspection car. 2. Measurement computer and evaluation software supplied by the customer. 1. Fast measurement rate saves time and therefore costs. 2. Higher accuracy than the previous subjective visual inspection. 3. Fire-Wire interface enables a fast transfer of measurement data. 4. 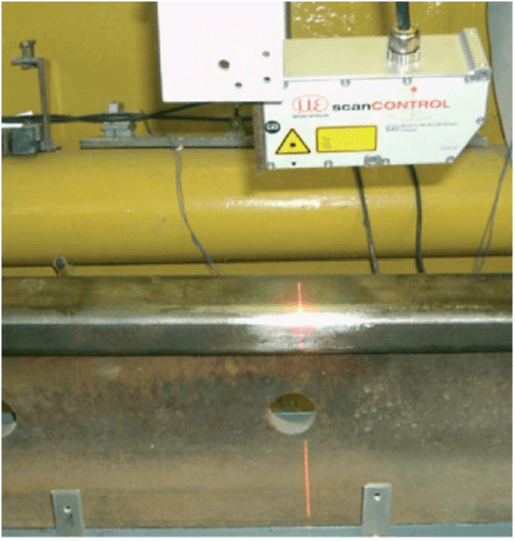 Customized adaptations (larger focusing distance, laser with 50 mW) lead to optimum results with this special measurement application.